In my PhD research I intent to write a computer program to simulate morphological changes in rivers. If you had the opportunity to browse my page about rivers, you can easily understand how important is to simulate the bed changes in alluvial rivers: A good bridge design can actually save lives! I am adding a sediment transport module to the fixed-bed hydrodynamic code River2D , in order to solve the bedload sediment continuity equation with the objective of simulating riverbed dynamics. So far I've been able to compute bed changes in channels with fixed lateral walls, as you can see in the examples shown below. I will also attempt to simulate planimetric changes induced by the erosion of banks. 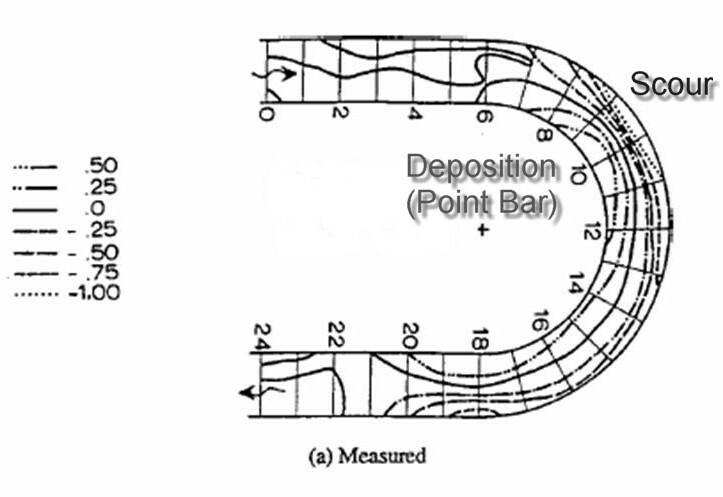 When the input of sediment into a channel exceeds the capacity of the flow to transport the sediment, the excess of sediment is deposited and bed aggradation occurs. Soni et al. (1980) conducted lab experiments of bed aggradation due to sediment overloading in a straight flume. In the experiments the sediment input was several times the equilibrium sediment transport capacity Ge of the flow. In the plot below there is a comparison between my bedload model (solid line) and experimental measurements (dots), for one experiment where the input sediment load is 4Ge. There is a fairly good agreement between the observed and computed values of the bed levels and water surface elevation (WSE). A channel width constriction will increase flow velocity and hence produce erosion in the long term. However, during the initial phase the opposite effect, deposition, may happen at the end of the constriction where the channel width returns to its original unconstricted width. 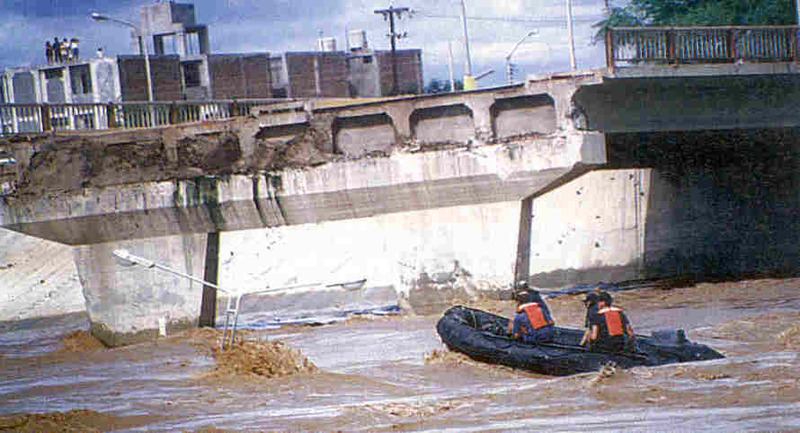 That may help explain why The Bolognesi Bridge, which is located at the end of a constricted reach in the Piura River, suddenly failed without warning during low flows 4 days after the peak discharge. 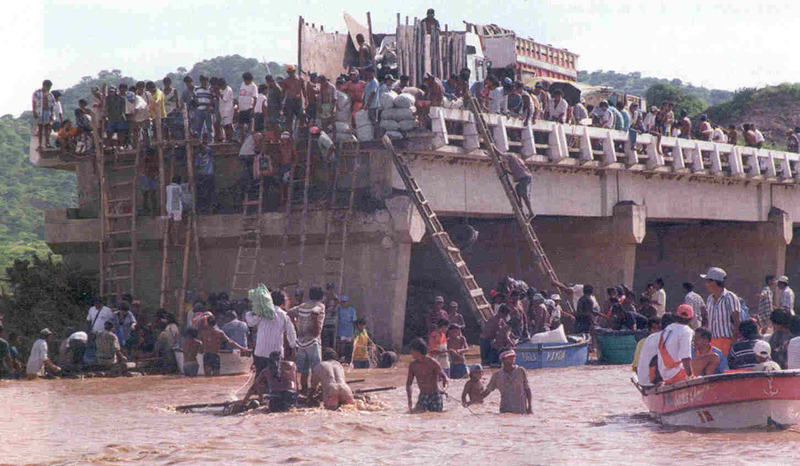 While The Viejo Bridge, which is located in the middle of the constriction, failed during peak discharge. I performed a qualitative test on a fictious straight channel that has a long contracted reach with gradual transition at both the beginning and the end of the reach (like the Piura River has). Initially there is an intense scour in the contracting zone (flow acceleration) and deposition in the expansion zone (flow deceleration). After a sufficiently long time, the deposited sediment near the expansion is washed away and all the reach shows net bed erosion, which is what 1D equations will predict. However, the dynamics of the bed is far more complex than empirical equations predict, even in this simple geometry. Scour in a long constriction: (a) Plan view showing the velocity field (b) 3D view of bed levels at the beginning and end of the simulation (roll the mouse over the picture), notice the initial deposition in the expansion. Bars are large scale bedforms that exhibit an alternate pattern of scours and diagonal fronts with height and wavelength comparable to the flow depth and the channel width respectively (see photograph on the right from a Japanese river). Alternate bars are a natural occurrence, although they have been observed even in straight artificial canals. The picture below shows the results of bed elevation changes from a numerical simulation of the early stages of alternate bar development in a straight flume. The initial width depth ratio is B/H = 34, the Froude number Fr = 0.69 and the bed slope S = 0.452%. Close to the inlet a small bump of about 1/10 the water depth was introduced to trigger the initial bar development. The preliminary results are only qualitative, but show that the model can simulate the main physical features of bar growth and migration. 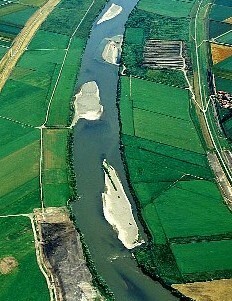 Braiding together with meandering are the two most common river planform geometries. 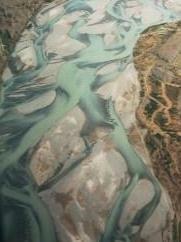 The multithread channel patterns of braided rivers are common on rivers with intense sediment transport. Below there is a picture of bed elevation changes from a numerical simulation of the early stages of braiding development The initial width depth ratio is B/H = 220, the Froude number Fr = 0.97 and the bed slope S = 2%. Random noise, smaller than the grain size, was introduced as an initial perturbation on the bed surface. The blue lines in the picture show a forming meandering thalweg, still unconnected at this stage. The red dots represent bedforms that have emerged above the water surface, that gives a sense of how wide and shallow the flow actually is. The flow becomes locally supercritical (Fr>1) at some points, but River2D can handle both sub- and super-critical flows (something most popular 2D model cannot do). 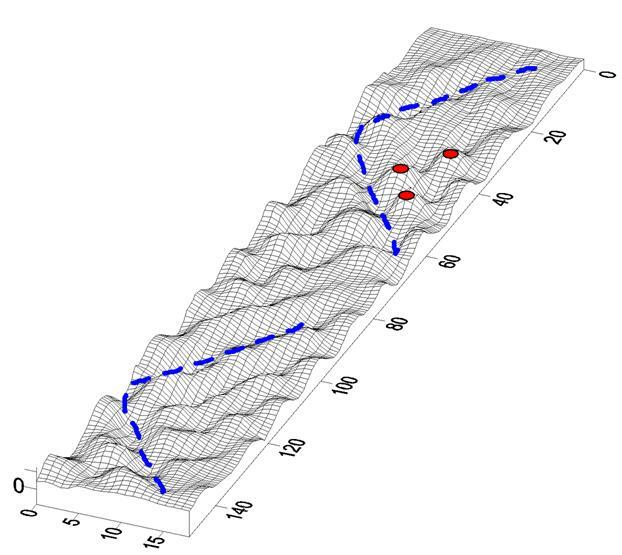 Early stage of braiding riverbed development; Blue lines represent the deepest part (thalweg), and red dots the highest bed elevations already above water surface. The previous examples were simulated using a conventional 2D Vertically-Averaged model. However, in bends the flow has a 3D structure characteristed by a spiral motion, also known as helical flow, secondary flow or transversal circulation (3). 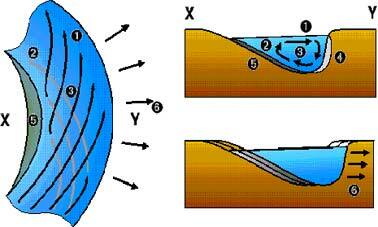 The centrifugal acceleration forces the flow in surface to move towards the outer bank (1), while the water and sediment close to the bed moves towards the inner bank (2). That causes scour in the outer bank (4) and deposition in the inner bank (5). Eventually, the outer bankline will tend to migrate (6). These flow features are lost by the depth-averaging process. 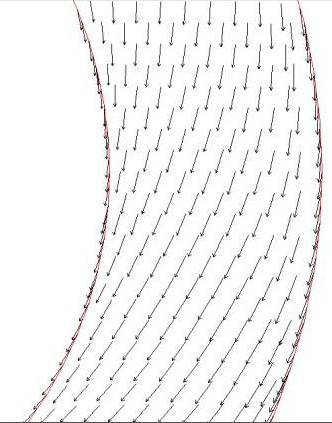 That's why 2D models must resort to some kind of secondary flow correction to account for this effect, which is critical to simulate scour and deposition in bends, as sediment tends to follow the near-bed velocity direction, not the mean flow direction (which is the one computed by the 2D model). I am also applying the Vertically Averaged and Moment (VAM) of momentum equations developed by Ghamry and Steffler (2002) to provide more detail in the vertical direction, such as surface velocity and near-bed velocity. In a sense, the VAM model is similar to a 3D model with few horizontal layers (typical 3D applications require 10 or more horizontal layers to resolve for the vertical profile of velocity). That ability to become a quasi-3D helps to resolve the complex helical flow in bends, without the computational demand of a fully 3D model. The 2D-VAM requires only about 50% more computational time than a conventional 2D Vertically-average model. The VAM 5-equation model assumes a linear vertical profile of velocity and solves two additional equations of conservation of moment of momentum to estimate the surface and near-bed velocity. Below are the plots of surface (left) and near-bed (right) velocity vectors computed by the VAM model in a bend. From these plots is evident that the secondary circulation is reproduced. 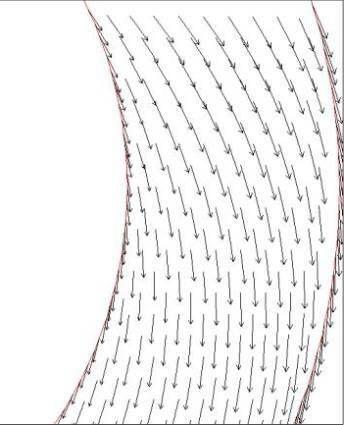 Helical flow in a bend computed by the VAM model. Left pane, surface velocity vector moving outwards. Right pane, near-bed velocity vectors moving inwards, transporting the eroded sediment from the outer bank towards the inner bank. Koch and Flokstra (1980) report the experimental results of scour and deposition in the Laboratory of Fluid Mechanics (LFM) flume. The LFM flume is 1.7 m wide with a central radius of 4.25 m, initial flow depth was 0.2 m and mean flow velocity 0.5 m/s. It is quite interesting to notice the “over-deepening” of scour in the outer bank (around section 10 in the plot below), where scour is higher than the expected equilibrium scour depth for a fully developed bend flow. Around the same cross section there is also an intense deposition in the point bar. This happens in the region where the flow changes from straight to curved downstream of the bend entrance . The location and magnitude of the points of maximum scour and deposition in bends are of special interest for river engineers designing bank protections and navigation canals. The color contour plot below right shows the results of the VAM-bedload model. The red color represents the deposition in the point bar, while the black and blue represent scour. Notice the resemblance between the simulated results and the measurements. Instead of using the traditional secondary flow correction of conventional VA models, the near-bed velocity computed by the VAM model was used to predict the direction of the bed shear stresses, as initially proposed by Jin and Steffler (1993). Left: Experimental measurements of bed erosion and deposition on the LFM flume. The scale represents the bed level change relative to the initial water depth. Right: Simulated bed elevation from the VAM bedload model. This is very much work in progress, it's been just a bit more than one year since I started writing the computer program and still many problems need to be addressed. I've already made a very crude attempt to see if channel widening and bank retreat in a bend with free boundaries can be simulated. The results are shown below. More definite results will be posted as I obtain them. Vasquez, J.A., Millar, R.G. and Steffler, P.M (2005). "River2D Morphology, Part I: Straight Alluvial Channels". 17th Canadian Hydrotechnical Conference, Edmonton, Canada. Vasquez, J.A., Steffler, P.M and Millar, R.G. (2005). "River2D Morphology, Part II: Curved Alluvial Channels". 17th Canadian Hydrotechnical Conference, Edmonton, Canada. Vasquez, J.A. (2005). 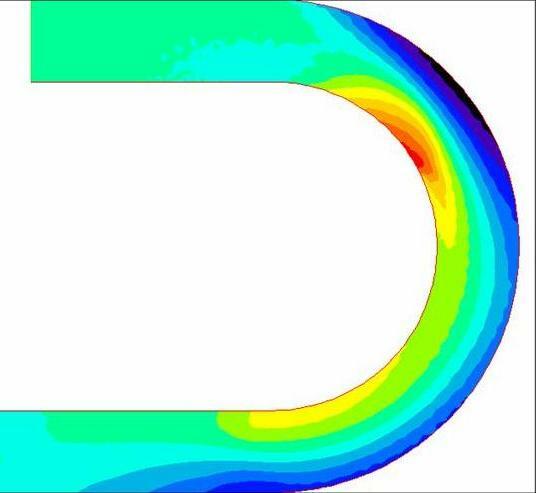 "Two-dimensional numerical simulation of flow diversions". 17th Canadian Hydrotechnical Conference, Edmonton. Canada. Ghamry, H.K. and Steffler, P.M. (2002) “Two dimensional vertically averaged and moment equations for rapidly varied flow”, Journal of Hydraulic Research, 40(5), 579-587. Ghamry, H.K. and Steffler, P.M. (2002) “Effect of applying different distribution shapes for velocities and pressure on simulation of curved open channels’’, Journal of Hydraulic Engineering, 128(11), 969-982. Jin, Y.C. and Steffler, P.M. (1993) “Predicting flow in curved open channels by depth-averaged method’’, Journal of Hydraulic Engineering, 119(1), 109-124. 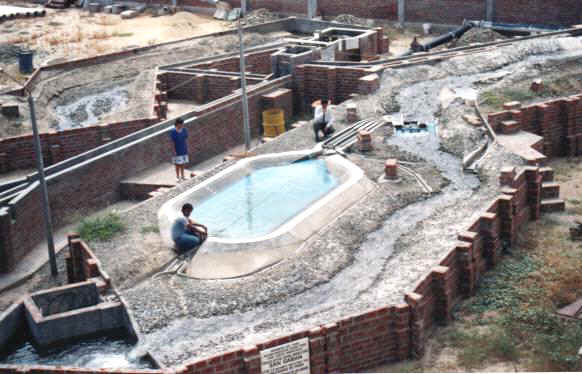 Koch, F.G. and Flokstra, C. (1980) “Bed level computations for curved alluvial channels”, XIX Congress of the IAHR, New Delhi, India, 357-364. Soni, J. P., Garde, R. J., and Raju, K. G. R. (1980). "Aggradation in streams due to overloading." Journal of the Hydraulics Division, 106(HY1), 117-131.